Understanding Hoya’s iD Lens Series "Quality Card"
Collectively, the HOYALUX iD MyStyle®, HOYALUX iD InStyle™, HOYALUX iD LifeStyle™, and HOYALUX iD Lifestyle cd™ make up the iD progressive series of lenses. Every HOYA iD series lens that is shipped includes a Quality Card from the proprietary HOYA inspection process. This is to explain that inspection process, the meaning of the iD series Quality Cards, and suggest inspection methods of these lenses using a lensometer. In past years, progressive lenses were produced using molded semi-finished blanks, and by surfacing spherical or toric surfaces onto the back of the lens. The design of the lens was incorporated into the molded lens blank at the factory, and the conformance of the molded progressive to the design was assured by inspecting the blanks during the lens casting process. After surfacing in the laboratory, the final Rx was verified by checking power at two points — the Distance and Near Verification circles. This process, which has been widely used since the introduction of progressive lenses, delivers predictable quality, and can be easily verified by ECP’s by use of a lensometer. The iD series of lenses are produced using what is known as HOYA Free-Form design and manufacturing techniques. The progressive design is not molded, but rather is a product of sophisticated software controlling modern machining equipment to produce complex surfaces. These surfaces, on both the front and back surface of the lens, combine to form the desired optical correction. Since surfaces are calculated and produced “on the fly” as opposed to mass produced, the iD series of lenses is fully customizable. The complex nature of the surfaces allows the lens designer to create better ways of correcting presbyopia, and delivers an improved visual experience for the patient. Advanced customized designs require advanced inspection techniques. Since lenses produced using Hoya Free-Form processing techniques do not use factory molded surfaces, the laboratory that produces the lens must assume the entire role of quality assurance. HOYA Free-form quality assurance means more than verifying power in the Distance and Near Verification circles. The purpose of the HOYA inspection process is to guarantee the design integrity over the entire surface of the lens. The result of that inspection is the iD Quality Card. As we describe the entire quality assurance process, the goal is to ensure eye care professionals trust the iD Series Quality Card when dispensing the iD series of lenses to their patients. The iD series of lenses are customized — and even personalized — for the wearer, based on advanced fitting parameters. This level of customization and optimization can produce changes over the entire lens, not just in the distance and near verification circles. As such, conventional methods of verifying progressives do not ensure the accuracy of fabrication. HOYA has developed an advanced verification process to ensure design integrity on every lens produced. This process uses a technique known as “lens mapping” to measure the through power of the lens over the entire surface of the lens (see Definitions for an explanation of through powers). within tolerance in those two places, but fail to deliver the intended design at other places in the lens. In those cases, the fabrication process has failed to maintain the integrity of the design, and will deliver a non-optimal visual experience to the patient. Every single lens produced in the iD series goes through the HOYA iD Verification System after HOYA Free-Form surfacing. Advanced lens mapping hardware is connected to proprietary HOYA software in order to measure the through power of the lens over the entire surface. The results are compared to the theoretically intended design for that patient. The output of the verification is a “Go/No Go” status and, only if a “Go” the printing of the iD Quality Card. 1. These lens maps show the through power of the lens across the entire surface. The entire lens is mapped and checked using multiple criteria. Many other brands of free form or digitally-produced lenses are only checked using the traditional PAL method via two points on the lens. 2. This power map shows what the software says the lens should look like. This is what you could refer to as the “control” or the ideal output for this patient’s Rx and it is what the actual lens will be measured against. Remember, since iD series of lenses may have customized insets, even lenses with similar Rx values could have different intended design maps. 3. The iD Verification System shows the deviation away from the intended through power at each point, using several different metrics. In this case we see a lens that failed. 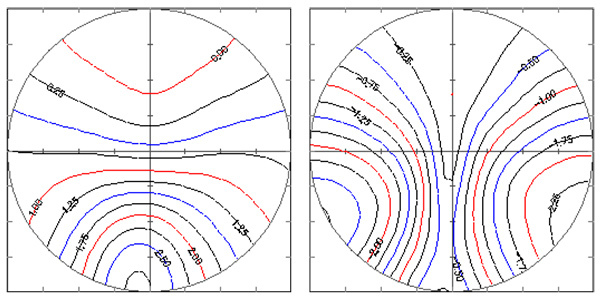 The dark red and blue indicate the lens is not close enough to tolerance to pass. This lens will be remade, and no iD Quality Card will be printed. Interestingly, the lack of dark shading at the Distance Verification circle means that this lens may have passed a less stringent inspection test. 4. 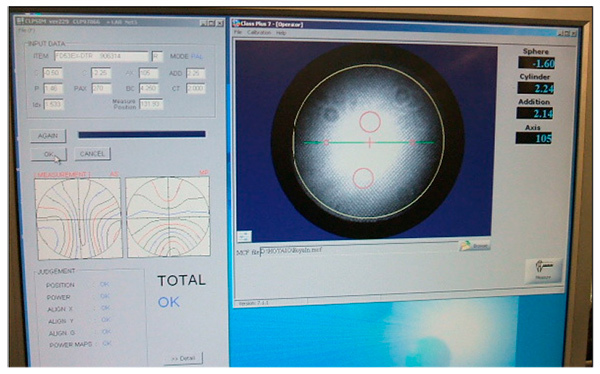 In the example shown here, the HOYALUX iD Verification System shows results of another lens. The lack of any dark colors means this lens is in tolerance, and conforms to this patient’s intended design over the entire surface of the lens. 5. When the system displays “OK” in all of the categories for a lens, then, and only then is an iD Series Quality Card printed. If “OK” is not displayed in all categories the lens does not get a card.This proprietary “’Go” or “No Go” decision is a much more rigorous validation requirement, and ensures you can trust that your patient is getting the intended customized design. 6. The iD Series Quality Card accompanies the lenses from the lab to the practice. The back of the card has a summary of the prescription, including any MyStyle “As- Worn” compensations (if applicable). The practitioner may want to consider sharing this with the patient to validate their purchase decision, and provide background for their next eyewear purchase. 1. HOYALUX iD MyStyle lenses can be compensated for position of wear. MyStyle lenses can be compensated based on fitting factors such as back vertex distance, pantoscopic tilt, and frame wrap angle. The compensations customize the lens corrections based on the actual fitting for each patient. If any POW compensations have been factored into an Rx, they will be noted on the Quality Card. ANSI Z80.1-2010 stipulates that if any POW compensations have been made, that ANSI tolerances are relative to the intended compensated Rx. a. In the Quality Card above, the right Rx requested was -4.00 +2.75 x90 Add 2.25. However, the compensation software modified the target to -3.97 +2.70 Add 2.08. NOTE: this prescription was written and ordered in plus cylinder convention. All plus cylinder powers are transposed and generated in minus cylinder convention. 2. The iD MyStyle lens uses “As-Worn” compensation for the add power (see Definitions for explanation of “As-Worn”). As-Worn compensation can be verified by a “W” in the last position in the engraved markings. This type of compensation adjusts the add power based on the Rx, size of the frame, and tilt. a. In the Quality Card shown above, the prescribed addition is 2.25 diopters, but the actual add power calculated and measured is 2.08 diopters. This is a fairly large compensation, and is the result of the high fitting height (“EP 24.0”). Again, using ANSI Z80.1 – 2010 you should be checking add power tolerance vs. the compensated value of 2.08.
c. Other iD series designs use Front add power by default. 3. 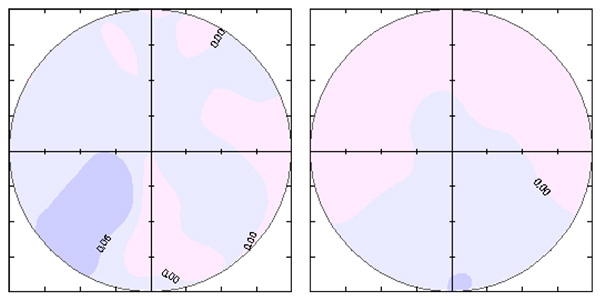 Since iD lenses are fully customizable – including the inset (horizontal difference between distance and near reference points) – a fixed marking template can not always be used to identify where the near reading area is located making the verification of add power even more difficult. 4. Due to the complex surfaces on an iD series lens, a smaller lensometer aperture (4 mm or less) is recommended if further verification is being done. Additionally, it is recommended that the lowest rounding value (±0.10D or 0.01D) be used on automatic lensometers. The higher rounding values (±0.12D or 0.25D) combined with POW compensation and complex surfaces can lead to lensometry errors and imprecise readings. This is the exact reason why HOYA developed the iD lens mapping verification system; to ensure the entire lens surface is checked and the surfaces fabricated into the lens are in fact delivering the optimal personal prescription to your patient and the utmost in patient comfort. The lens has passed a rigorous validation test over the entire surface of the lens. The customized iD design that was intended for the wearer has been accurately produced. The iD Quality Card can be trusted as it represents a much higher standard of inspection than conventionally produced progressives. 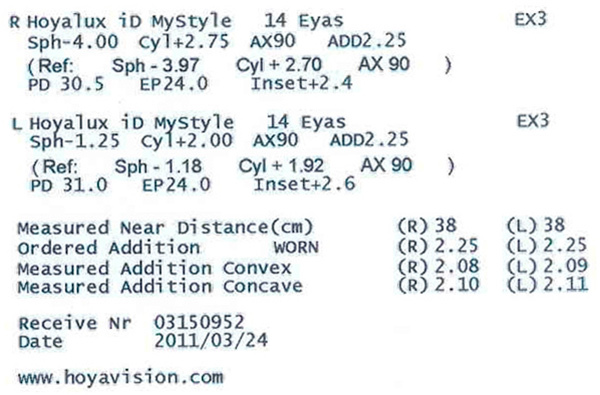 The Quality Card reports the actual measurements of the given iD lenses including as-worn compensations. Through Power = the sum total of the front surface, lens material and back surface refractive characteristics. This is a more complex value than simple sphere and cylinder powers as measured on a conventional lensometer because it measures the design and optical performance at every point and angle of view over the entire surface of the lens. Lens mapping = similar to a lensometer measurement in that lens mapper introduces light to the surface of a lens, and measures how that light is refracted. Lens mapping, however, does this over the entire surface of the lens, and then constructs a digital map that shows power and astigmatism continuously. As-Worn = changes to the lens design and surface powers ground on to the surface of the lenses are compensated for how the lens is positioned in front of the eye in the chosen frame relative to the position of the phoropter lenses in the refraction environment. The compensated powers that are ground on the lenses may or may not agree with the powers ordered since the vertex distance, frame face form angle and wearer’s pantoscopic angle vary from that of the phoropter. This is similar to the power compensations made for a contact lens prescription from a spectacle lens prescription, particularly in moderate to higher powers, because of the lack of vertex distance for a worn contact lens compared to the spectacle Rx.